Also, the above image is visible by naked eye only after you stare at the sky for about five seconds, when the eyes adapt to the brightness — unlike halo, which is easily visible immediately. It's more similar in how it looks to cloud iridescence. But again, there were no visible clouds anywhere around the Sun — the day was unusually clear. Also, cloud iridescence seems to make clouds colorful much farther from the Sun's disk that what I observed today. So I now begin to think that the Sun is always surrounded by a rainbow similar to the above, even in clear weather. My question is, is this true? Or does it depend on weather (humidity? ), geographical latitude, season? 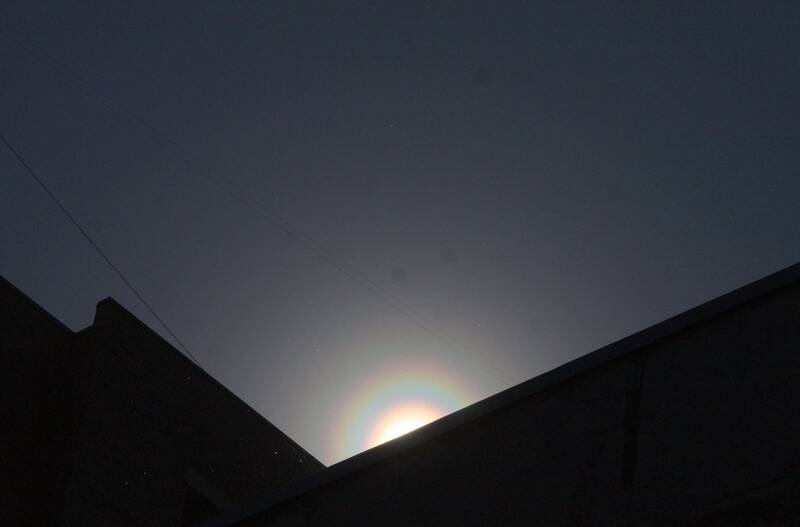 Although you say a halo would require cold weather it actually needs ice crystals that can appear higher in the atmosphere to produce halo when it isn't cold in the surface. But I agree with you it is not a halo. Also I don't know why you think this picture shows a triple rainbow, to my eyes there is only one. I would say just by the looks of this that this is a corona. There is definitely no ice crystals at higher altitudes, but the bending of the light happens quite near the surface of the earth. Since you say that it isn't cold then there cannot be ice crystals. With ice crystals ruled out the only possibility that comes to mind: pollen corona. I would guess you have a pollen season of some kind currently. Similar images of pollen corona for example in here. Would you see a rainbow from refraction when the sun is in front of you? How do you see a rainbow?